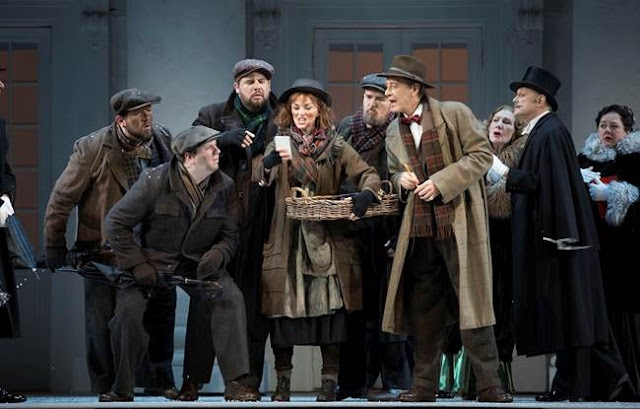 Saturday, ChiIL Mama will be ChiILin' in Chi, IL, at Lyric Opera of Chicago, for the press opening of the American premiere of a new production of Lerner and Loewe’s My Fair Lady, starring Richard E. Grant and Lisa O’Hare as Henry Higgins and Eliza Doolittle. We can't wait! Lyric Opera is renowned for world class productions and their annual crowd pleasing Broadway at Lyric series is always a hit. The production runs April 28 through May 21 (press opening April 29) at Lyric’s Civic Opera House, 20 N. Wacker Drive, Chicago. Tickets start at $22 and are available now at www.lyricopera.org/myfairlady or at 312-827-5600. Principal casting for My Fair Lady also includes Bryce Pinkham (Freddy Eynsford-Hill), Nicholas Le Prevost (Colonel Pickering) and Donald Maxwell (Alfred Doolittle). All make their Lyric debuts with My Fair Lady. My Fair Lady is the fifth title in the Broadway at Lyric series. The larger-than-life production is presented on a grand scale fit for the Civic Opera House, with 56 cast members, 37 orchestra musicians and nearly 300 costumes! David Chase conducts and Olivier Fredj directs the American premiere of Robert Carsen’s critically acclaimed production from Théâtre du Châtelet in Paris with an all-new cast. The creative team also includes choreographer Lynne Page, scenic designer Tim Hatley and costume designer Anthony Powell. To learn more about Lyric, go to lyricopera.org. You can also join the conversation with @LyricOpera on Twitter, Instagram, and Facebook. Lyric Opera premiere of Lerner & Loewe’s My Fair Lady generously made possible by The Negaunee Foundation, an Anonymous Donor, Mrs. Herbert A. Vance and Mr. and Mrs. William C. Vance, The Jacob and Rosaline Cohn Foundation, Robert S. and Susan E. Morrison, Mr. and Mrs. J. Christopher Reyes, Liz Stiffel, and Northern Trust. Production created by the Théâtre du Châtelet Paris, on December 9, 2010, in coproduction with the State Academic Mariinsky Theater.